Every day we need to soak in His Word, let it resonate in our souls and settle deep into a Sabbath rest of the heart. May the reminder of His promises be a balm to you as we seek Him first in each of our journeys. Join me at the beginning of the week for a reminder to take a soul stop in the power of His Word and be rejuvenated for the week ahead. I have been reading the story of a desperate woman, recently, soaking up truth as I contemplate grace through it. I can see the parallel of her life with mine in some ways. Desperation looks the same no matter what the circumstances. And there have been times I have felt desperate. The narratives in scripture tell us more than history, they reveal humanity and how God met them where they were, how they received Him. They were faith-dwellers hungry for more of God, broken souls who met grace and came away changed. When we are wandering in our desperate moments, the grace God pours out quenches our thirsty souls. The 4th chapter of John tells us about a woman, a well, and a Savior who asked for water. It is a story about grace and redemption and love meeting the lonely. It is a story we all could be a part of because although the details of our lives are not the same, the feelings are probably familiar. The woman in the story was desperate to be known, to be seen, to be loved, whether or not she would admit it. God always knows our needs before we know them ourselves, and our need always necessitates God’s grace. Grace has a way of finding us in less than popular situations. Perhaps that is what makes grace so amazing. Jesus made a journey to a town that was supposed to be avoided. He sent his disciples off to find food, leaving him alone at a well in the heat of the day. Because He knew that he had an appointment to keep. Jesus had a mission of redemption. He had a purpose to reach those who were destined to abide, to reach the unreachable and the unloved so they would know the lengths the Father would go to find them. Check this truth: Jesus traveled through a parcel of forbidden existence to meet with a woman who He would reveal His identity as Savior to. He will travel to your well of desperation to meet with you and reveal His identity as Savior to you, also. Only God will step outside of the boundary lines of man’s rules to meet with the broken, rejected, and lonely soul. He purposes to bring all the lost back into the fold and He sees the detour that it requires as necessary. In his commentary on John 4, Matthew Henry said that “Moderate men are wondered at.” He was pointing out that Jesus treated this woman different than she expected. She was considered a forsaken woman, barren, empty and unworthy. 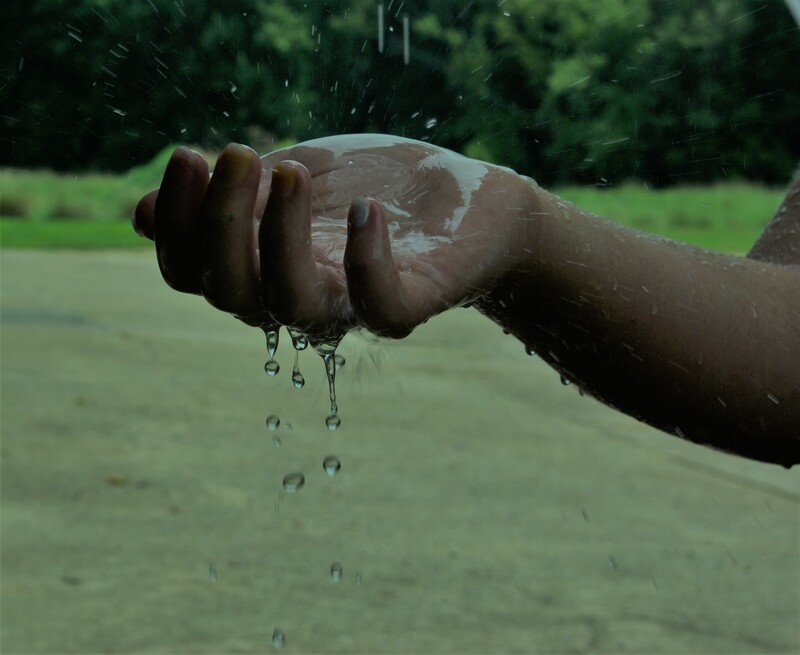 She marveled at Christ’s request for water, that He even spoke to her. I wondered as I read, if His words were the only kindness she may have known. His purposeful pause at Jacob’s well was an opportunity for love and redemption to take place. She had some reservations but Jesus challenged her intellect and engaged both her mind and her soul with His words. The audacious way He met her in her isolation spoke to her in that space that had been left untouched. She left the well in haste to tell the others what she found. She was immediately changed with the realization that the man who asked her for water was the Messiah they had been waiting for. I am always amazed at the way God chooses to meet us in our living. 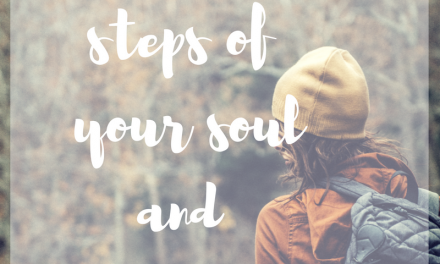 He shows us that grace is a gift, the kind that seals our soul and establishes our destiny. The reality was, she was thirsty, too. She questioned Him, reacted in her limited understanding, and even boldly confronted Him. 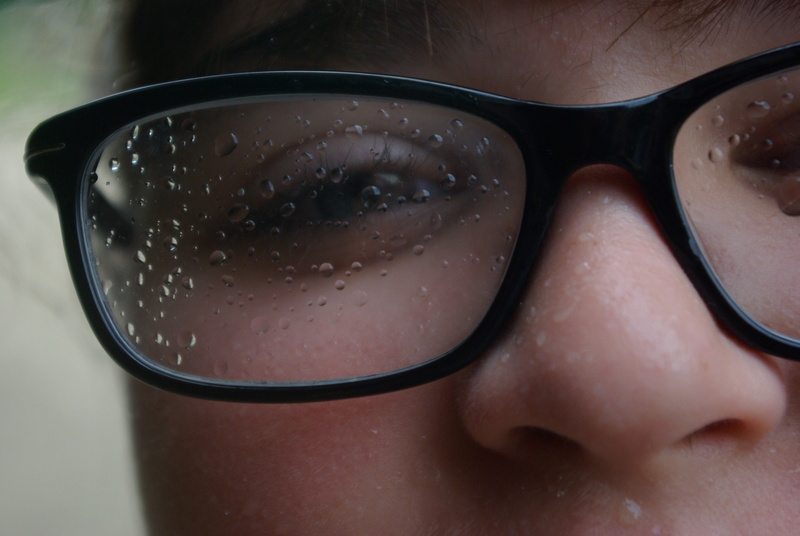 She wanted the water that would quench her thirst…but she didn’t understand. Christ took the occasion to teach her Divine things. He converted her by showing her Truth. Through grace He shed light on the veil that covered her understanding, and opened, perhaps for the first time, a new door of freedom and an awareness that the Living Water is His Spirit in us. These parched places in our soul can only be quenched by the presence of God. I realized how alike we were. 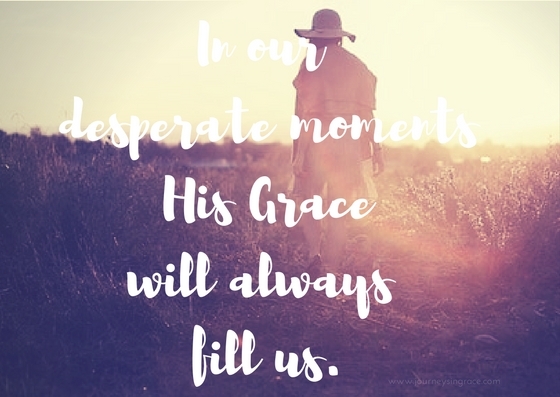 I am desperate for grace, too. I am like this woman who comes to the well tired and heavy with burdens that I can’t seem to forget and a history that keeps replaying in my mind. Those things that steal grace and rob peace and remind me that I mess up more than I get it right. She asked for water, but needed His Truth. He was offering grace, but it wasn’t until He identified Himself that restoration finally came. Christ confessed His identity to her and she believed Him. It was His most revealing conversation recorded up to this point in scripture, and the first time He acknowledged his identity. He hadn’t even spoken these words to His disciples, but His impartial acceptance was the sprinkling her barren soul required to awaken the unknown longing for a drink of heaven. 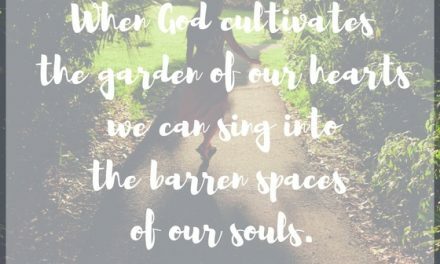 When grace melts us at our well of emptiness, our brokenness is redeemed, our stories are rewritten, and our testimony brings others the same freedom. And friends, she was more than changed. She became an evangelist to the community that rejected her. She became a broker of grace for all those who abused her. She became a well-spring of hope for all those who were desperate like her. She spilled life with her testimony because she met, I Am, and believed. What if we come to the well looking for more of God? If we thirst for God, knowing He will provide more than abundantly, His Salvation will always satisfy us fully. It makes us bold, in the walk by faith not by sight kind of boldness so that we not only share the good news… we pour it out, like the unending life-giving water it is. Praying for His fullness for you this week. Moments of Hope, #DreamTogether, Unite, Cheerleaders of Faith, Tell His Story, Coffee For Your Heart, Three Word Wednesday, Thought Provoking Thursday, Grace n Truth, #Chasing Community, Fresh Market Friday, Faith n Friends Blog Hop, Missional Women, Dance with Jesus, Glimpses with Barbie, Give Me Grace. Beautiful images of grace, here. It’s my word of the year. I love how just one word can touch our souls for 365 days …and beyond. Happy Tuesday, from the #DreamTogether linkup. That story is so powerful. You did a beautiful job of applying it to our lives. God is so good! I feel that I can’t ever hear enough about grace. It’s still so incredible to me. Thanks for sharing! I thought this post was thorough, wonderfully thought through; thank you for some food for meditation! How much I can relate to that woman at the well. Desperation hidden under a guise of normal is all too easy. Grateful God sees us in those places and knows exactly how to reach us. Thank you so much for your encouraging words! Yes, He was probably her only experience with kindness. How sad to go through life not being loved or affirmed! What a beautiful reminder of the gospel. God is so good. I am so loving how God works in our lives and connects us together with like minded people. I cannot tell you how valuable this post was to me. I was reading the same exact verses in scripture this week and love a fresh, but similar perspective. Thank you for sharing. God is so full of Grace. Grace…we have been given so much of it. What a beautiful blessing. 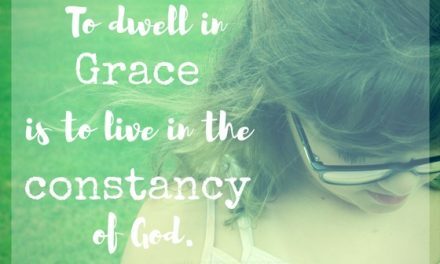 Thanks for sharing your wonderful post on Grace and Truth.